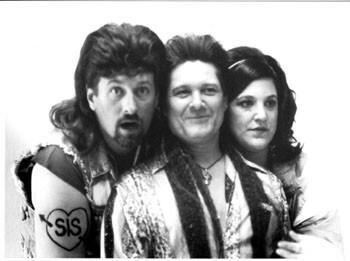 Guns 'n' Ammo: l-r: Larry William, Bill Wright, and Dani Innocenti-Beem channel their inner trash. You can find white trash anywhere in this country. It's amazing, really. Of course there's white trash in the South--the cradle of white-trash civilization--but in Manhattan you will find New York white trash, and in Amish country you can find Amish trash. Probably Eskimos have poor Eskimo trash, the people who have dog sleds up on ice blocks in front of their run-down igloos. And admit it: Most of us have some trashy blood running through our family trees, which is why white-trash humor is alternately so embraced and mocked. White-trash culture fascinates, repulses, and delights us in spite of ourselves. The folks at TheatreNow--who were responsible for last summer's surprise hit Buck and Betty's Chuck House of Fun--have returned with a brand-new musical goof paying homage to the trash in all of us. Written and directed by Larry Williams, who collaborated on the songs with assistant director Kayla Gold, Trailer Trash: The Musical transports us to Paradise Trailer Park, whose inspiration seems to be halfway between the pink flamingos of John Waters and the horrific sideline characters of David Lynch. The staging makes the most of its outdoor setting in a meadow adjacent to Mary's Apple Creek Cafe in Sebastopol. Hay bales compose half of the seating, and the trashy props strewn all over--an abandoned kitchen sink, a rusty lawn mover, cheap pink nylon lingerie stung up on clotheslines--are so convincing that you almost think that the theater has always been this trashy. The musical opens with tragic news: Bart Blackhead (William Wright) was found dead in a nearby pond, impaled on a strange object. The no-nonsense Detective Sanders (Caylia Chaiken) and her handsome but dingy young assistant, Buzz (Bryan Hendon), arrive on the scene to get to the bottom of the case. Every witness--Bart's best friend, his wife, the pool cleaner, and, miraculously, Bart himself--has a different account of the events leading up to Bart's death. Does the setup sound familiar? That's because Trailer Trash was inspired by Rashomon, the 1950 Akira Kurosawa movie. Love, betrayal, ambition, jealousy, and shame all come into play as the colorful denizens of Paradise speculate over who the true culprit is. But the similarity in structure to Rashomon does not extend to tone, and Trailer Trash blithely proceeds through musical irreverence. The trashy cast of characters includes a kindhearted, airheaded Jerry Springer devotee (Kim Williams, who must get cold in her scanty halter top and teeny tight shorts); a NASCAR fanatic who speaks "Dude"; and a Crocodile Hunter protégé with a terrible Australian accent. Targets include bowling, AC/DC, hair treatments, and mullets. Which is like shooting fish in a barrel, true; the humor isn't so much inspired as it is inherent. Still, the cast--particularly Dani Innocenti-Beem as the iron-hearted Sharon Blackhead, Gail Gongoll as the shyster psychic Gladys the Great, and Larry Williams as clueless greaser Floyd Carbuncle--tackle their lines and songs with winning enthusiasm. The playful, lively visuals bring Trailer Trash alive. The costume, makeup, and prop folks must have had a field day scouring thrift stores in search of the most clashing lime-green leggings, bleached-out blue jeans, and tasteless-slogan T-shirts they could find. The songs--the spot in musical comedies where killer lines are best showcased--are funny at best. Standouts include a musical ode to Jerry Springer and the manliness hymn "Man's Man." Carl Jordan's choreography (which, yes, includes line dancing) helps keep the pace chugging along, though given the contagious energy of the cast, the production would benefit from a faster tempo to really hammer the madcap spirit. Live sound effects and musical asides, courtesy of the band Tom and the Cats, go a long way in achieving this. That Trailer Trash was written, designed, and produced in a six-month span is very impressive. The amount of detail, hard work, and affection that TheatreNow poured into it is palpable, and it's that element overall that makes the musical such a lighthearted pleasure. The belly laughs may be few and far between, but the appeal of Trailer Trash is as irresistible as the opening strains of "Sweet Home Alabama." 'Trailer Trash: The Musical' plays June 7, 14, 21, and 28 at Mary's Apple Creek Cafe, 9890 Bodega Hwy., Sebastopol. $20 adults; $10 seniors and students; $5 children five to 15; children five and under free. 415.453.9174. From the June 5-11, 2003 issue of the North Bay Bohemian.